You are here: Home / Breeds / Pocket Beagles: Do They Really Exist? There’s much debate about the legitimacy of the Pocket Beagle breed. Some argue that there’s no other Beagle size other than the standard 13-inch and 15-inch variations, while other breeders claim to have been breeding these miniature Beagles for decades. No matter what these differences of opinion are, though, there’s one thing we can agree on: Pocket Beagles are gentle and sweet dogs with a fun-loving nature. Also called Miniature Beagles and Toy Beagles, these pint-sized pooches are excellent companions, just like their full-sized brothers. If the breed became extinct, what’s a Pocket Beagle nowadays? What does a Pocket Beagle look like? What are the characteristics of a Pocket Beagle? Are Pocket Beagles easy to train? How much exercise does a Pocket Beagle need? How do I keep my Pocket Beagle healthy? How much are Pocket Beagle puppies? Small Beagle-type breeds were popular in 13th century England, where they were used by nobles to hunt. Queen Elizabeth I owned Pocket Beagles, which were so called because they fit perfectly into hunters’ saddlebags or pockets. These dogs stood 8 to 9 inches tall at the shoulder. Miniature Beagles were bred to hunt rabbits and small animals together with larger hounds. The bigger hounds flushed out prey while the tiny Beagles chased the quarry through the undergrowth. These Beagles’ small size allowed them to run easily through shrubs and plants on the forest floor. Queen Elizabeth I reportedly loved these little dogs, calling them her ‘singing Beagles’ and letting them run around between the plates and cups on the royal table. Pocket Beagles remained popular in England until the 19th century, when the breed became extinct. Modern breeders have attempted to recreate the miniature Beagles of old. Like Lemon Beagles, though, these mini Beagles are not a separate breed. The modern-day Pocket Beagle is becoming increasingly popular, thanks to its endearing, compact size and the positive qualities it inherited from the Beagle. The distinguishing feature of the breed is its size. A full grown Pocket Beagle stands at 7 to 11 inches tall (17 to 27 cm), weighing only 7 to 15 pounds (3 to 6 kg). 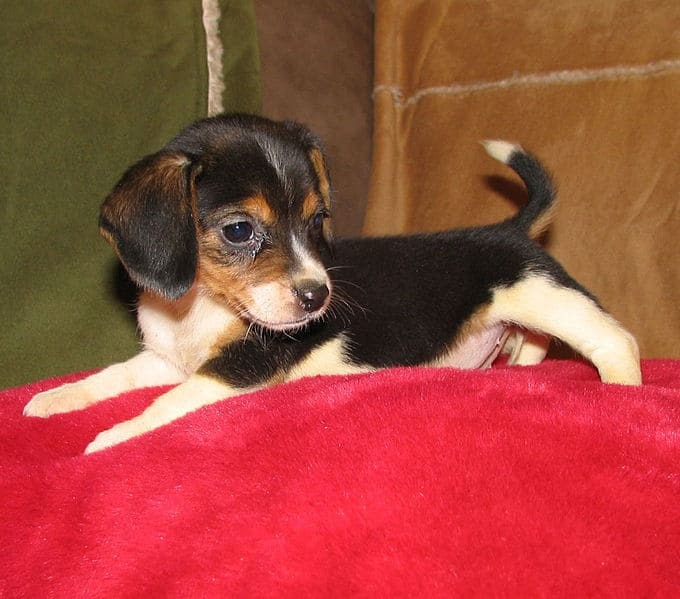 Some breeders refer to the smallest of these Mini Beagles, those weighing under 10 pounds, as Queen Elizabeth Beagles or Elizabethan Pocket Beagles. Like their bigger brothers, these Beagles have a soft, soulful expression that will tug at your heartstrings. Just try resisting those large, dark brown or hazel eyes. Square noses and floppy ears complete their adorable faces. Most of these smaller Beagles have a short, dense overcoat of straight hair and an undercoat of softer hair. Their coats may come in colors of black, cream, tan, white, blue, gray, amd lemon. Whatever their coat color is, these dogs’ tails are usually tipped with white fur. These miniature Beagles share the temperament of their bigger counterparts. These dogs are outgoing and fun-loving, friendly with most people and animals they meet. And while their affectionate nature makes them some of the best companion dogs, it doesn’t make them the best at guarding or protection. It’s not unusual to see these Beagles with their nose down to the ground, searching for a scent or following one wherever he can. The Beagle’s nose, after all, has approximately 220 million scent receptors. Pair this extraordinary nose with the Beagle’s inquisitive nature and you’ve got a dog that’s unafraid to explore his surroundings. Make sure your yard is fenced-in so this toy Beagle won’t wander off your property when he’s playing outside. Due to its compact size, the Pocket Beagle is the perfect apartment dog. It doesn’t need a lot of space, and it’s happy as long as it gets frequent exercise. Although they’re loving and gentle, Miniature Beagles can have a stubborn streak. Their independence makes training them an interesting experience, to say the least. A patient owner and creative training techniques make for a well-behaved Mini Beagle that displays positive behavior and follows your commands. Treats will also go a long way with these food-loving pooches. Games and toys will also keep your Pocket Beagle from getting bored. A bored Beagle is something you don’t want in your hands, as these dogs will inevitably find ways to entertain themselves, whether through howling, digging, or trying to escape your yard. 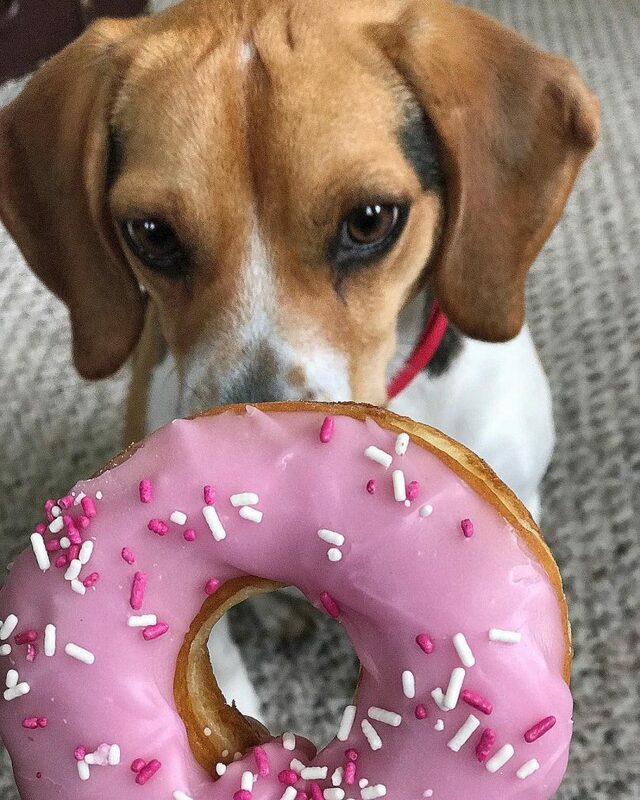 As we’ve said before, these Beagles love their food. They won’t let anything stand in the way of their mouth and the food bowl, not even your kids’ fingers. Make sure you spend time teaching your Miniature Beagle and your kids appropriate behavior when your pet is eating. Keeping a Mini Beagle around small pets may also pose a problem. These dogs were bred to hunt, so they’ll probably see bunnies, birds, and hamsters as quarry that they have to chase and catch. One way to prevent this from happening is through early socialization. Introduce your Beagle to other pets while the dog is young. You won’t usually have problems with Pocket Beagles and barking, unlike with other pint-sized pups. That doesn’t mean they don’t make noise, though. These hounds tend to do three distinct vocalizations: a bark or growl, full-on howling, and a half-howl. Howling is something Pocket Beagles do when they spot animals they want to chase. Make sure you’re ready to work with your Mini Beagle to control its barking and prevent it from howling at all hours of the night. Much like 13-inch and 15-inch Beagles, Pocket Beagles are active dogs. They’ll need at least an hour of exercise daily, so make sure you take your dog out for frequent walks or spend time playing with it in the backyard. Be patient with these pups, though, as walking them will take more time than expected. They’ll want to sniff everything and anything they come across. Keep in mind that it’s possible to over-exercise these small pooches. Smaller Beagles are not equipped to handle the same activities, like jogging, hiking, and obstacle courses, as their full-sized brothers. One of the easiest ways to ensure that your Miniature Beagle is healthy is giving it a proper diet. You don’t need to feed this small pooch much; around 1 cup of high-quality dog food divided into at least 2 meals is enough for these Beagles. These dogs will overeat if given a chance, so make sure you monitor the amount of food you give them. Portion control ensures that your Mini Beagle avoids obesity. It’s also crucial that you choose the right kind of dog food for your pup. Small-sized kibble will be easier to handle for its tiny jaw. 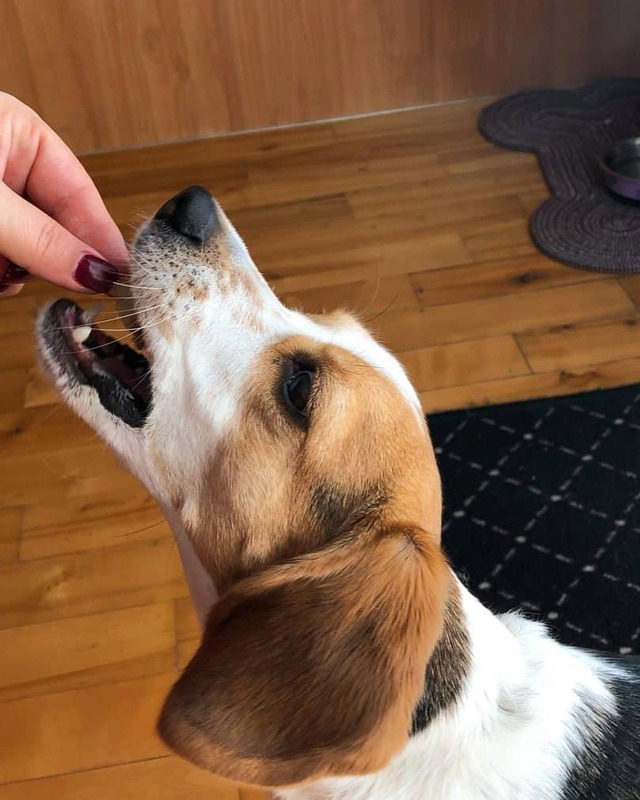 Packed with protein for strong bones and fat for energy, the best dog food for Beagles is also a good choice for this pooch’s diet. Brush the Mini Beagle at least once a week with a medium-bristle brush to remove dead hair from its coat. You can also use grooming gloves to make handling your dog easier. Regularly brushing your pet Beagle not only keeps its shedding under control but also encourages the proper growth of new hair. Unfortunately, the Pocket Beagle is not hypoallergenic, as this breed tends to shed all year long, with more hair falling out during the spring. This heavy shedding season is your pooch’s way of preparing for its thick new winter coat. 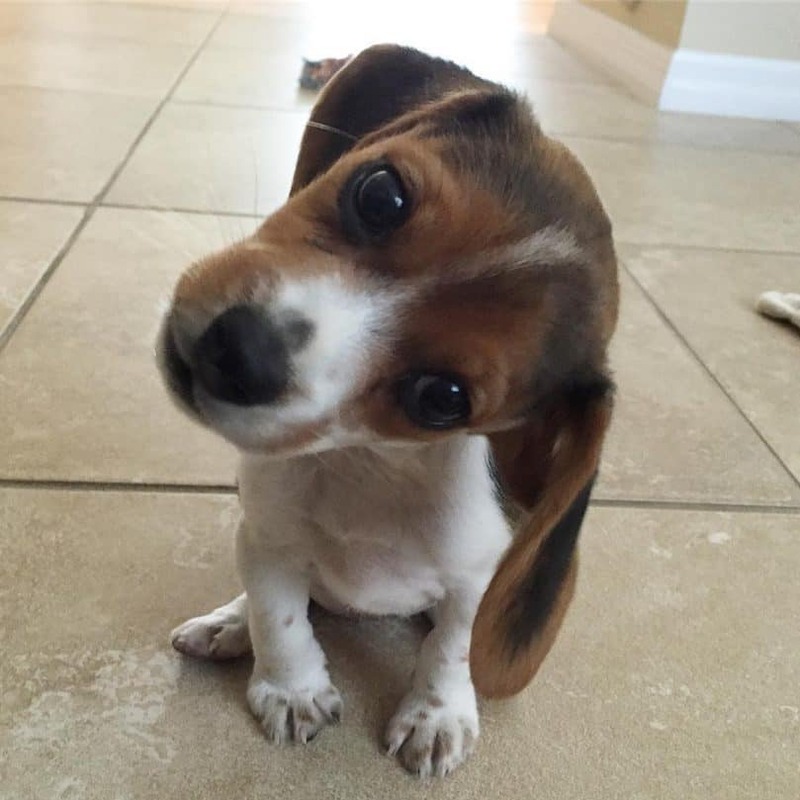 Like bigger Beagles, Miniature Beagles have drop ears that are prone to infection. Check your dog’s ears weekly to remove any debris and waxy buildup. You can also prevent infection by keeping water or oils from entering your pet’s ears. The Pocket Beagle has a life expectancy of 12 to 15 years, but various health issues can affect how long a Pocket Beagle lives. Common in regular-sized Beagles as well, these health issues include eye disorders, patellar luxation, intervertebral disc disease, hypothyroidism, and epilepsy. Due to their fragile frame, Miniature Beagles can be easily injured, too. Make sure to teach your family members, especially kids, the proper way of holding the dog so it doesn’t get hurt. If you’d rather get adult Pocket Beagles, you can also opt for Pocket Beagle rescue or adoption instead. Check with these Beagle rescue organizations or shelters to see if they have a Miniature Beagle for you to take home. 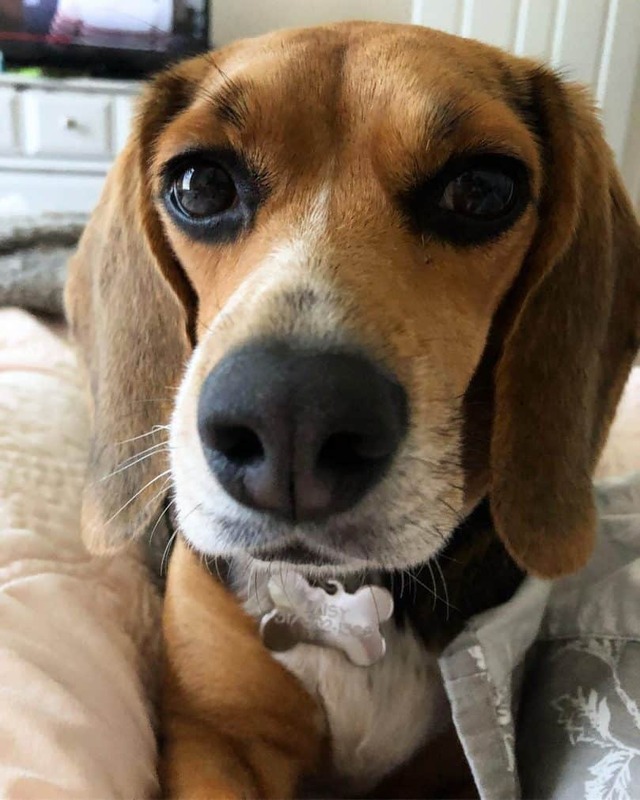 Queen Elizabeth Beagles, Olde English Beagles, Miniature Beagles, Toy Beagles – whatever they’re called, these dogs are lovable, friendly pooches that are perfect for any family. These miniature Beagles are smart and inquisitive, and they have an independent streak that you must control with creative training techniques. You must also be prepared to train your dog to control its tendency to howl. What do you think about these pint-sized cuties? Tell us in the comments!